Before I leave the forum for good, I thought I'd give you all one more scenic photo to look at. I use it as my desktop wallpaper. It was taken by a member of our local photographic society. It's looking roughly Northeast from Fidalgo Bay, off shore about a half mile from downtown Anacortes. The left-most mountain is Mount Baker. The barge in the right foreground is moored at one of the two refineries on March's Point, which forms the eastern shore of the bay. 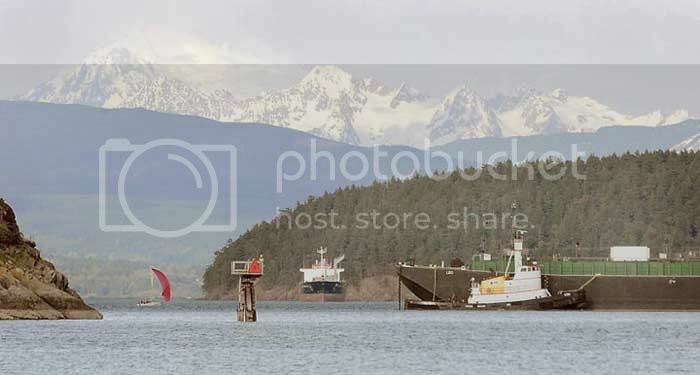 The tanker in the background is anchored in the bay, either getting ready to go back to Alaska for more crude oil or waitng to dock to pick up refined products. What a fabulous location Frank. It`s a scene to die for. Reminds my of high-summer holidays in France and Germany with scorching temperatures and snow still on the mountains. Lucky man. On a sadder note, it`s goodbye for a final time, it was good to correspond over the years. It's a fabulous view Frank. I'll miss your input. Sorry to see you go. What a beautiful photo, Frank. Thanks for all your postings over the years - I am sorry to see you leave. All the best - you will be missed! Have been away touring in our motorhome for a couple of weeks - went up to Cape Reinga and on way south called at Marsden Point, New Zealand's refinery, where there is a marvellous model, reputedly cost over a Million$ to make (in Holland) and a brilliant Audio/Visual presentation @ the NZRefinery Visitor Centre. Unfortunately I still haven't worked out how to post pics on this site! Now House and Pet sitting in New Plymouth - lousy weather here while step daughter and family are enjoying sunny Rarotonga for a week. Enjoyed your pics and contributions Frank - have missed something somewhere about where you're off to - whatever; ENJOY! Once you've done that download or upload, whatever, your photos from your PC onto that program, then you can copy and paste the URL into the forum.. can explain that later if you wish.